The Fellowship was fortunate enough to obtain a copy of ESCAPE FROM NEW YORK #1 from BOOM! Studios. Christopher Sebela writes, Diego Barreto draws and Marissa Louise colors. We pick up Snake’s story at the end of the movie, as he’s leaving the President in the lurch. With some work he manages to get away, heading south. He falls in with a group of zealots heading to Florida, which seceded a while back and is now run by the Twins. Getting into Florida is no picnic, though; they have a gauntlet, which he runs in typical Snake fashion. Snake Plissken is a great character, of course, the very model of an anti-hero in a high-action futuristic America. It’s good to see him back in action, especially in an original story. Comics should prove to be a good medium for him, too, since he can go pages without speaking. We get some cool world building here as well, seeing more than just US prisons. The art works well, too, with emphasis on the action scenes. Meeting the Twins on the last page is an interesting turn, and I suspect it won’t be the last. This is going to be a fun series, so get on board now. 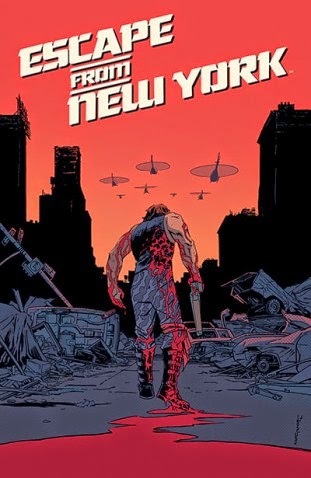 ESCAPE FROM NEW YORK #1 is available now at your FLCS or at boom-studios.com.